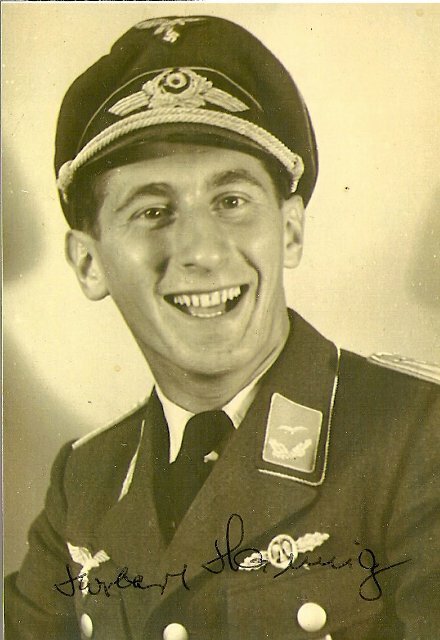 Norbert Hannig was a fighter pilot in II./JG54. After the war he worked in the german Bundeswehr, retiring as Oberstleutnant. Altogether, Hannig achieved 42 kills in over 200 combat missions. Question: Dear Mr. Hannig, first let me thank you for this opportunity to talk with you. Today, we will concentrate on several details of your time in the Luftwaffe. Main topics are things which are not described in your book „Luftwaffe Fighter Ace“. Can you please provide us with some impressions from your basic training? My first flight teacher was a former bomber pilot, who got the EK I. That guy sat besides me in the Bücker 181. In such a machine, pupil and teacher could see directly what the other did. Question: Now let us talk about your second time at a flight school: In summer 1944 you were transfered as a flight teacher to the Ergänzungsjagdgruppe Ost in Liegnitz. What comes to your mind when you think about this time? First, there were the young guys. They just had much too little fight hours to really use and fly their machines well. Second, you had the former bomber pilots. They knew their job, but not the one of a fighter pilot: They were drilled on perfect group flying and always tried to follow "Pinsel und Kugel" [the position instruments]. They went on flying so correct, even if they had to do evasive maneuvers or similar within a dogfight! Question: Let's change to more technical questions, which are interesting for readers who like flight simulations. Did you ever work with the cooling flaps of the 190? Hannig: No. These flaps were fixed in our machines. Comment: In the A-5 and later, there was a mechanism, but also Eric Brown says that in his 190A the flaps were fixed at 1/3 open. Question: Did you ever have to make an emergency landing due to technical problems? Hannig: Yes, one time my landing gear did not come out and after several tries to get it out, I had to do a belly landing. It came to light that when pulling in the gear, the corresponding electrical motor did not stop and then got blocked. That was during my time in Liegnitz. Question: The Focke-Wulf 190A had an automatic positioning of the propeller etc. via the „Kommandogerät“. Did you fly the machine with manual Prop-Pitch? Hannig: No, I personally did not. But I know, that for example Emil „Bully“ Lang did this when climbing, to get more out of the aircraft. He was a very experienced guy („alter Hase“) and had been a pilot for Lufthansa before the war. Question: At which speed did you land? Hannig: We came in at ca. 145 km/h and touched down at 120. Question: During the time in the Kurland pocket, did you have machines equipped with MK108? Hannig: I don't remember that. But I know that there were several planes equipped with rockets. Comment: Probably, this were aircraft from Schlachtgeschwader 3 which was partly based in Kurland. Question: In your book, you describe an accident due to a round exploding in the barrel of a MG151/20. Could you please tell us a bit more about this? Hannig: Yes. The ammunition included a mechanism, whic activated the round only after shooting: Inside the barel, the rounds got a spin around their longitudinal axis. The resulting centrifugal force pressed two small balls inside the ingnitor outwards and the time to self destruction started running. In my case, I assume sabotage in the production. The industry used a lot of pressed workers... I was very lucky: When the round exploded in the barrel, the root of my wing was damaged, but nevertheless I was able to return safely. Question: Now we look into tactical topics: What were the major mission types in the East? Hannig: Mostly – depending on the situation - we flew „freie Jagd“ (free hunt) as Rotte or Schwarm (two or four planes). Later, in Kurland this changed due to the lack of fuel. We had two Gruppen based there, one in Windau and one in Libau. Here we mostly started if an alarm occured, meaning only if an enemy air attack was detected. Question: Did you have really long dogfights, some kind of „duels“ with soviet fighters? Hannig: No, most dogfights were quite short. One attack and then pull out again, something like that. Rarely only we had a longer fight. One detail which I remember in that context: The IL-2 were pretty hard to down. But they had one weak point, the oil cooler. If it was closed, the plane was protected but the engine overheated. When the russian pilot had to open the cooler again, he often flew very low to protect his cooler from attack from below. Question: Which quality characterized a good fighter pilot? Hannig: Very important - mostly decisive - was the ability, to see the enemy first. We often tried this when waiting for our bombers, which we were to protect. Bully Lang for example was able to see such a formation at distances of >50km, if they came in at the same altitude. Question:Was your machine ever hit during a fight? Hannig: Yes. While attacking american bombers from Liegnitz I received 21 hits. During a dogfight with russian fighters, one of the upper cylinders was hit. Altogether, I had ca. 250 combat missions. During the missions in Kurland we had contact with the enemy quasi every time. Question: First, your memoirs were published in english and later only in german language. There are some differences between these versions, which I'd like to talk about. For example, in the german book you describe the historical and political context from your personal point of view and comment on it. This misses totally on the english issue. Hannig: Yes, the english publisher was interested ina pure description of my personal experiences, therefore eveything else was omitted. Hannig: … I would like to go deeper on that: In the english version, this experience is described with all the horror I felt and the horrible condition in which these people were. The company, which produced the german version changed this part in the book without my knowledge. I must really distance myself from the description in the german version, which falsifies the historical events! Question: As someone who grew up in the Federal Republic of Germany (born 1970) I found your comments on the political situation and development about the time of Nazi-government as well as the present very worthwhile reading. Can you please say something about the time of ´33-´45? Hannig: Basically I think, it is wrong to present this time as pure crime. For example, the idea of a youth organization was good. Youngsters didn't the idea to make trouble or burn cars. Youth criminality as a whole, drugs etc. were very well prevented. In democracy, I see one problem: It is directed by the quantity of voters, not by the quality of heads. Question: Dear Mr. Hannig, at the end I would like to thank you for the opportunity to talk with you and wish you all the best !